The Wii U is Nintendo's next (gen) console and their primary effort to boost sales, survive their financial crisis and to stay in the game with the 2 big console players. Though it carries the name 'Wii', it is in most parts largely different from the predecessor and this is particularly noticeable with the lack in motion controls. The Wii U, however, now focuses heavily on its online interface and this post will serve to point out the main must-knows of the systems. There are three major highlights and they are the Nintendo Network, the Miiverse, and also the Internet Explorer. The first thing you'll need to understand is the difference in your Nintendo Network ID and your user account. Afterall, both of the terms used suggests very similar functions, and it is there that I feel Nintendo could have done better (scroll below also for a video by Nintendo explaining the differences). Basically, your user account will be your log-in for your Mii character, a unique identification from other users on the system. The Nintendo Network ID, on the other hand, is the main ID to control the console. First thought of the the Nintendo Network would be Nintendo's effort to compete with Microsoft's Xbox Live and Sony's PSN, but going deeper into it and you'll find this unique ecosystem of gamers actually interacting; or in their term, the Miiverse. 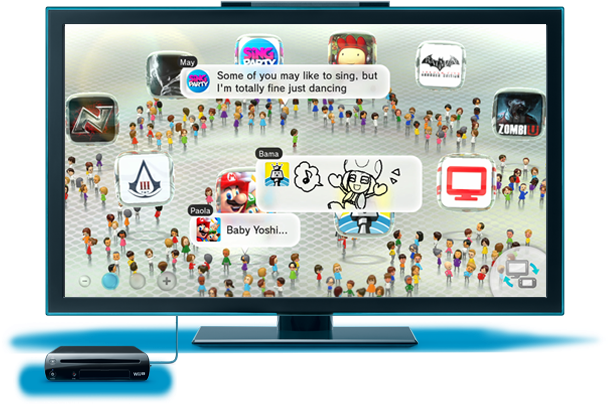 The Miiverse is more than just adding friends or barbie-dolling your character, it is about the sharing and the discussion between gamers worldwide together on one ecosystem. It allows gamers to help one another by posting their personal tips on getting through a level, or similarly for anyone to ask for help at any certain level in the game. Basically, it is like a forum integrated live in a game and this idea, though it does have its loopholes, will seem to prove very useful and definitely interesting to test out. *The Wii U has been released in the US, will be launching on the 30th in Australia, but no information have been released for Malaysia.